As the hours draw late into the evening at a wedding is when the fun really starts. Often everyone has had a few beverages and the DJ has ramped up the music mix to bring everyone to the dance floor. 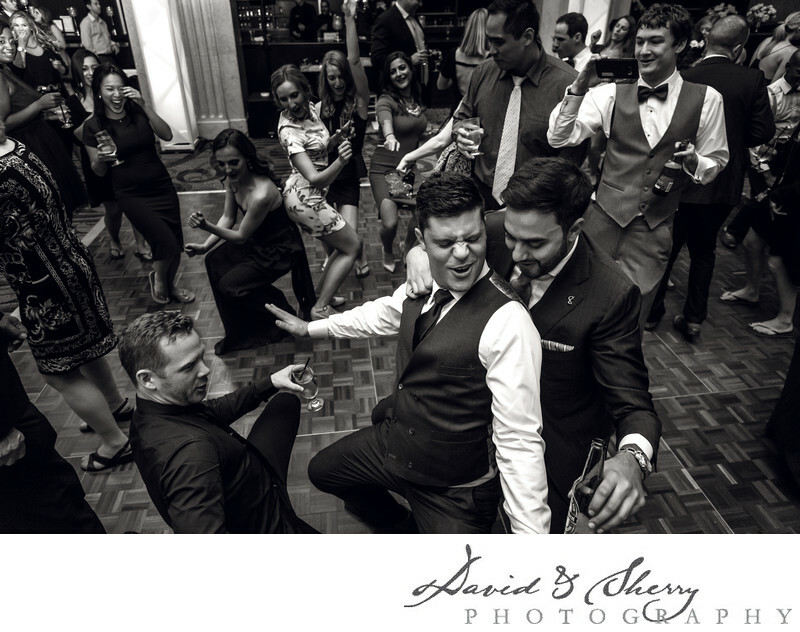 People who have been friends for years get together on the dance floor and start moving to the music, sometimes with beer in hand as is seen in this photo where the groom is getting down with the beat and enjoying the evening of his wedding day. We love these types of moments at weddings as they make for great photography. When we are older we would love to look back on our youth to see the exuberance and joy that we had way back when and these pictures will be looked on with that longing of youth many decades from now. One King West was the location of this dance floor filled with people who have partied together for years and are currently bridesmaids, groomsmen and friends. After the cutting of the cake, the saying of vows and the saying of speeches provide some of the best moments that ever happen at weddings.